This is a listener suggested episode, which I love doing. I enjoy receiving requests from listeners asking for specific topics to explore. Several people have had questions about B2B product management. A B2B company sells its products to other organizations while a B2C company provides its products to consumers. To explore this topic, I asked Jeff Lash to join us. 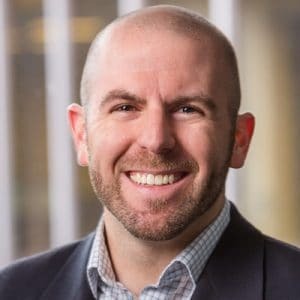 Jeff is a recognized thought leader in product management, with over a decade of experience in the development of Web-based products and SaaS systems. His product management career includes both new product launches and major turnarounds of existing product lines, as well as creation of the product management role into organizations. He has significant expertise in customer understanding, new product innovation, agile product management, user experience design, and product development processes. He is a Vice President at SiriusDecisions, a research and advisory company for B2B organizations. While the focus of our discussion is on product management for B2B companies, there are tips and practices B2C product managers will find valuable too. How does B2B product management differ from B2C? The B2B product group is like a smaller business in a larger business. B2B product managers are generally responsible for an entire product while a B2C product manager may be responsible for a portion of a product, for example, the Search capability of a product. While there are many similarities, I’m starting to see some trends in differences, such as with the importance of user experience design. Also, B2B product managers are more involved in enabling and helping the sales team be successful. How do B2B sales models impact product management? Direct or indirect sale channels are part of the B2B product manager’s tools and responsibilities. Product Management is interlocked with the Marketing and Sales function of an organization. Product managers can get overloaded by Sales and sucked into helping too much with questions and customer calls instead of doing the work of product management. Organizations that excel have balance. They have clear responsibilities for product managers in terms of how they support Sales and well-communicated ground rules. Also, Product Marketing exists as a function to transfer knowledge of the product to rest of the organization. We see alignment between the executives responsible for Product Management, Marketing, and Sales. How do buying roles impact product management? This is a key difference with B2B product management compared to B2C. In a B2B environment, there are multiple buyers, such as Decision Maker, Champion, Influencer, and GateKeeper, in addition to the actual users of the product. Product managers need to address personas for each of the roles involved in the buying process and also help Sales understand these roles and vice-versa. How can product managers avoid the “one-off” practice that some B2B organizations find themselves in – customizing a product for each customer? Organizational culture is a key influencer to this situation. Some cultures permit sales professionals to write new product capabilities into customer contracts and then product management has to find a way to satisfy the expectations created by Sales. This is a poor practice. Executives need to be in alignment and have a clear means of addressing specific customer requests. One technique is to have an agreed upon percentage of product management and development resources to respond to requests from Sales. For example, 20% of the roadmap is set aside to be sales opportunity driven. Also, when new product functionality is needed to “close” a deal or keep a customer, an expectation of the customer is needed. An example is to require a sales contract with the customer before beginning development of the new functionality. Further, product managers should track the requests for “must have features” to close sales deals against those that actually close. Product managers can use such requests as an opportunity for a customer inquiry visit to learn more about the actual need. What are factors in determining pricing for B2B products? We find a lot of product managers are uncomfortable with pricing. Instead of thinking about a single price for a product, think in terms of a pricing and packaging strategy. This could involve different tiers, different combinations of product feature packages, and different use cases. Pricing is fundamentally a function of value. Examining the other ways customers are trying to solve the problem the product solves is a way to make judgments about value. What can product managers do who receive feature requests indirectly and not from customers? It is very difficult if not impossible to be a good product manager if you don’t have the opportunity to talk with customers, buyers, and users. I see organizations where Sales “owns the relationship” and they don’t want product managers interacting directly with customers. When requests come in for product features – from Sales, Tech Support, etc. – use them as opportunities to ask to talk with the customers making the request. You won’t be successful every time you do this, but you will some of the time. You can get creative and find other sources for the information you need, such as someone who chose a competitor’s product over yours. Product Management leadership also needs to set expectations for the customer involvement that is needed. Blog posts for understanding customers’ needs: Customer Interviews, Customer-Focused Behavior, Prioritizing Customers’ Needs. Blog posts about pricing: Pricing Best Practices, SaaS Business Model.